This week’s news includes support for children through the Make-A-Wish program and $237k in charitable donations. 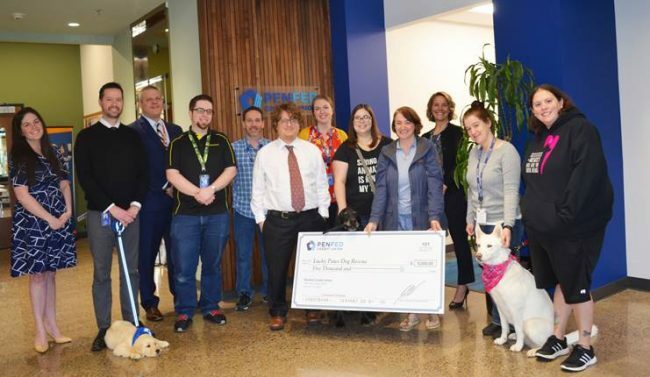 Service-dog-in-training Journey (left) and employees from the $24.4 billion Pentagon Federal Credit Union in Mclean, Va., present a donation to Lucky Paws Dog Rescue. The group is joined by the Northwest Battle Buddies’ volunteer puppy raiser program. In total, PenFed’s Eugene Service Center donated $15,000 to Lucky Paws Dog Rescue, Meals on Wheels Lane County and Volunteers in Medicine. PenFed employees met with the charities in March and presented them with the checks. These donations are part of PenFed’s commitment to giving $100,000 to nonprofit organizations in the Eugene, Ore., area this year. Each quarter, PenFed’s Eugene Service Center employees select local charities that align with the credit union’s core values of giving back and making a difference in the communities PenFed serves.